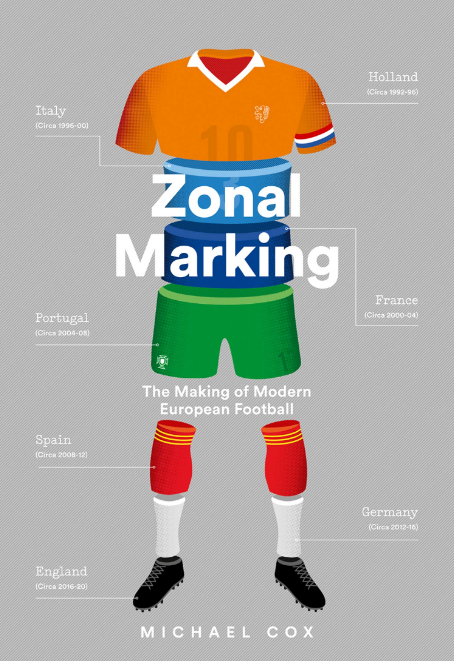 It’s often argued that the major European leagues are becoming increasingly similar, and there are no longer significant variations in tactics. What are the reasons for this? An increased number of foreign players and managers? More television coverage of foreign competitions? A greater number of European matches? Globalisation in general? That debate is for another day – here, we investigate whether the major European leagues are as similar as is assumed. First, passing. This supports old stereotypes. Serie A boasts a methodical, considered passing game – the faster, more physical nature of English football means fewer passes find their target. Perhaps the most surprising league here is La Liga – it has reputation as being technically excellent, with most teams looking to play a sophisticated passing game, but in fact its pass completion rate is significantly lower than Italy or Germany. A difference of 4% between Italy and England seems quite large – one more pass astray every 25. Traditionally, England was home to the long ball game – the foreign leagues saw more sophisticated, shorter passing. Is this still the case? 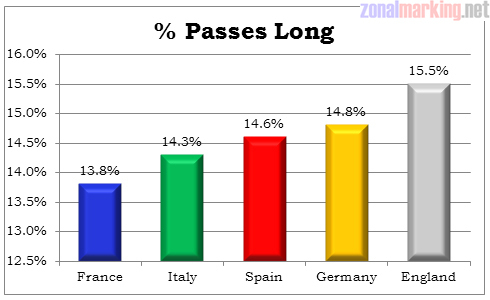 This would demonstrate that things haven’t changed that much – English sides are more likely to launch the ball long (‘long passes’ are defined as passes that travel more than thirty yards). Many would be quick to blame the likes of Stoke and Bolton for distorting these statistics (although they both play better football than they get credit for), but the top sides aren’t blameless – the likes of Peter Crouch at Tottenham and John Carew at Aston Villa are targetmen that thrive on long balls. It’s a decent – if not particularly strong – correlation; you wouldn’t feel entirely stupid putting a ‘line of best fit’ on that graph. 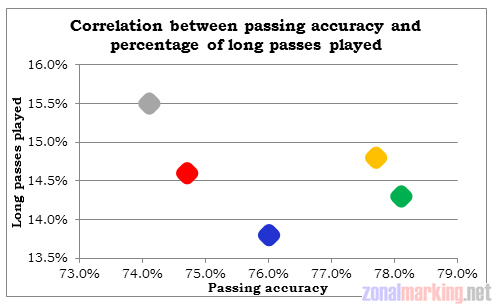 One might question why France features such a poor passing accuracy percentage when they seldom knock the ball long – although perhaps it’s a simple case of Ligue 1 being the lowest-quality league from these five. This table also reflects well on the passing ability of players throughout the Bundesliga – even though they pass the ball over long distances more frequently than in La Liga, they remain more accurate. One argument that might explain why passing accuracy (and, indeed, distance) is such in English leagues is down to the more physical, pressing game that seems to be prevalent in midfields. How often do you see a midfielder with time and space to pick a pass? Rarely – there is often a player in his face immediately, hassling and harrying him in an attempt to win the ball or pressure him to the extent that he misdirects his pass. 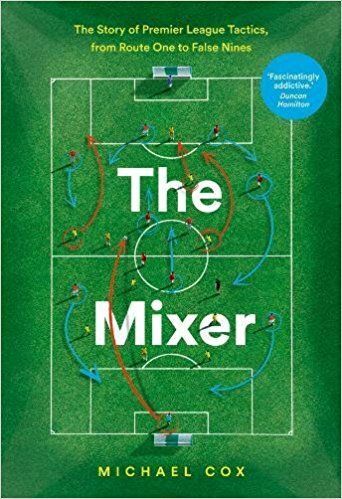 It’s much harder to do something accurately when under pressure to do it quickly – whether that’s down to the work of opponents, or down to the fast tempo and physicality of English football, I’m not sure. In Spain and Italy, one might argue, much more emphasis is placed on keeping the shape of the team defensively, and not instructing players of the ilk of Michael Brown or Tamir Cohen to get amongst the midfield and disrupt their play. This lack of time (and indeed space) in the midfield often leads to midfielders passing the ball back to their defenders or goalkeeper in an attempt to retain possession, who in turn tend to play the ball long to their strikers to bypass a pressurised midfield. However, this in turn does have an effect on the technical ability of players, and their passing game. When you have more time and space to execute a pass, the chances are that your game revolves around that, and ensuring that your passes find their target, especially in games where measured build-up is valued higher than pace or tempo. When there’s always an opponent in your face, this is much harder to do. When young players have to deal with this, they are bound to concentrate less on developing technically, and more on developing physically – how many times have we heard about players (like Kevin Keegan, for instance) being rejected simply for being “too small”? Unless you’re blindingly quick like Wright-Phillips, when it doesn’t matter if you are tiny and can’t control a football. My argument is doubtless flawed in a major way. However, I do find it hard to believe that the answer is “simply” that the English league is full of technically-poor players. Even those imported in with excellent techniques struggle, with Robinho being an excellent example at the moment. Do Man City and West Ham still play long ball even though they have Italian managers? It’s a strange one with Mancini and Zola – both Italian, and both trequartistas/forwards. If they play defensively it’ll be the “classic Italian mentality”, if they push men forward it’ll be their “old attacking instincts”! also another thing, I wonder what the difference in the English league between the Top 6 or 8 vs the bottom half of the league. I rather happen to like Mancini and Zola, but i am a bit bias…..
Are you joking or just another case of pre-conceived ideas? I mean you started brilliantly with the graphs and analisys, then suddenly this rubbish analisys about the French League. Are you sure you are reading from the same graph published? Your analisys obviously shows the english media mentality towards the french: ignorance if not xenophobic.To call it lower quality passing accuracy when is ahead of Spain and England and with the lower long ball game, and that England poor accuracy got to do with pressing in midfield, clearly demonstrates your ignorance in observing and analising matches. I’ve been playing professionally in england for over 10 years now and I can tell you there is no difference between sunday league and some Premier League games, except for the stamina factor. So for you since the french contingent came to play for Man U, Arsenal and Chelsea, there are no quality players left in France? What you have to blame is the coaches mentality on how to play football from grassroots up to the PL. That’s where the problem starts. Then you concentrate on players’ technique. You can’t pass or be confortable on the ball without technique. And where are these players in England? You may count them with the fingers of one hand only!! My, someone has an inferiority complex about the French league. What exactly are you denying? The French league is indisputably the lowest-quality league of these five listed, in terms of both quality of teams and quality of players. There is little doubt that the Bundesliga, Serie A, the Premiership and La Liga are on a different planet to Ligue 1. Quite how it is xenophobic to rank one foreign league behind three other foreign leagues, I’m not sure. And yes, it is reading it from the final graph. 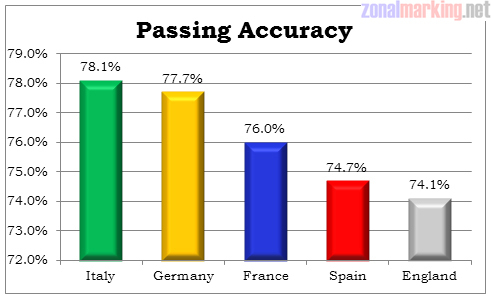 As you can see, France’s passing accuracy is very low, despite the fact they rarely hit the ball long, which is out of sync with the other leagues. Do you have an explanation for this? I’d be interested if you do. Otherwise, it’s fair to say it’s linked to the lack of quality in the league. My friend, the UEFA coefficent got nothing to do with league quality, but rather european exploits; and that is another argument, because there’s a lot of variables involved. Following your line of thought, I just want to see your justification for the lowest quality league, in your opinion the French league, to have a better passing accuracy than the English league(top of the UEFA coefficient). You say “Figures taken from OPTA” but OPTA does not offer stats like passes or long passes for non-Premier matches. I wonder how did they get averages for La Liga?